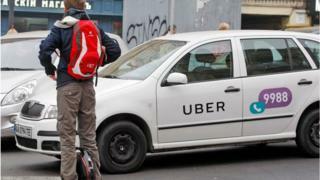 Uber, the ride-sharing app and delivery business, has warned it "may not achieve profitability" as it finally released details of its plan to float. It will list its shares on the New York Stock Exchange, in a deal likely to value the US firm at about $100bn (￡76.5bn). But it also expects operating expenses to "increase significantly". Chief executive Dara Khosrowshahi, who replaced Uber co-founder Travis Kalanick, said in a letter: "Over the past 18 months, we have improved our governance and board oversight; built a stronger and more cohesive management team; and made the changes necessary to ensure our company culture rewards teamwork and encourages employees to commit for the long term." Uber is one of a number of so-called unicorns - private investor-backed companies worth $1bn or more - that are planning initial public offerings this year. Image caption Uber's smaller rival Lyft has seen its share price sink 15.2% since its flotation at the end of March. Uber's smaller rival, Lyft, was the first of the group to float, but since listing at the end of March, its share price has fallen by 15.2% to $61. Pinterest's listing, which is expected next week, could raise up to $1.2bn in funding for the firm. The new leader of the military council pledges to restructure the country as protests continue. Why do people get so angry about food?